For a review of the climatic conditions in the Sary Kamysh area, and the type and sequence of people that lived there, see Tsvetsinskaya E.A., Vainberg B.I., V. Glushko E.V. . The 8-7 c. BC period investigated by L. Yablonsky is but a time slice of the millennium period when Masguts were known under this name. The English version was translated by the author. I apologize for the specialized terminology, and for the specifics of the material, which necessarily goes into much detail. The details are valuable in their precision, they preclude any attempts to falsify the facts or explain them away as errors, blunders or obsolete data of the ancient contemporaries. Professor L. Yablonsky is an outstanding archeologist and anthropologist. Unfortunately, this article does not include, in addition to the ethnographical description, the summary of the physical anthropology study and the genetic analysis. The magnificent finds from the Scythian barrows on the territories north of the Black Sea and the Caucasus have been long since and firmly included into the fund of world culture. Up to comparatively recent times, much less has been known about the achievements of the eastern neighbors of the Scythians, whom ancient Persian written sources called the 'Saka'. However, excavations undertaken in recent decades by the Soviet archaeologists in the Kazakhstan, Altai and Tuva have shown that, in the 8th-5th centuries ВС, the territories east of the contemporary course of the Amudarya were populated by some powerful pastoralist groups. The surviving artifacts of material and spiritual culture prove beyond any doubt that deep inside Asia communities were developing which were not inferior in any respect to the Scythians, but which were culturally specific, largely due to the pattern of their contacts with the civilizations of the Ancient Orient. The reference here, in particular, is to such sites as Issyk (Akishev 1978), South Tagisken (Tolstov & Itina 1966), Uigarak (Vishnevskaya 1973) and others in Kazakhstan (Akishev 1983), Pazyryk in the Altai (Rudenko 1960), and Arzhan in Tuva (Griaznov 1980). As regards the areas west of the contemporary course of the Amudarya, planned excavations of burials and settlements belonging to the early Saka period began there not very long ago but immediately produced some most interesting archaeological material which has shed light on some as yet unknown events from the history of the Saka population in the west of Central Asia (Vainberg 1975; 1979; Yablonsky 1986; 1988). A few words about the paleogeographical situation in that area will be in order here. Today the Amudarya carries its water towards the Aral Sea, but it was not always so. During the Neolithic (5th-4th millennia ВС) and in the Early Iron Age (early 1st millennium ВС), the waters of the Amudarya ran westwards, in the direction of the Caspian Sea via the Sarykamysh lake and the Uzboi river that issued from the latter (Figure 1). Now the territory of the ancient western delta is completely waterless and much of it is covered with sand, whereas in the early Saka period it was densely populated by groups of semi-sedentary animal-breeders whose settlements and burials we find today on the channel banks. According to the custom of the steppe tribes, hemispherical earthen barrows (kurgans) were constructed over graves. The Khorezmian expedition of the Institute of Ethnography of the USSR Academy of Sciences has excavated nearly 150 early Saka kurgans in the ancient delta region. This paper discusses one of them, kurgan 23 of the burial Sakar-Chaga 6, which has been studied by the author. Figure 1. The Aral Sea and surrounding area, a = kurgan. Either by chance or, probably, due to the foresight of the ancient inhabitants of the delta, the kurgan was not constructed centrally with relation to its grave pit. For this reason the robbers, who were eager to plunder rich necropolises even then, could not find the burial, which survived to the present day untouched - a great piece of luck for the archaeologist. However, the uniqueness of this burial is not confined to this burial alone, for in situ it contained some artifacts which are both beautiful examples of ancient applied art and, moreover, have no known analogies among the material from sites of the Saka so far investigated. It is important in this connection that these artifacts were discovered together with many pieces of weaponry which allow us to date the entire complex quite closely. The body was interred in a rectangular grave pit. In the four corners of the burial chamber were post-holes with no traces of wood in them; it can be surmised that we have here an imitation of a post structure. (Such a supposition can be supported by reference to the fact that sometimes such post-holes contain parts of the grave inventory.) 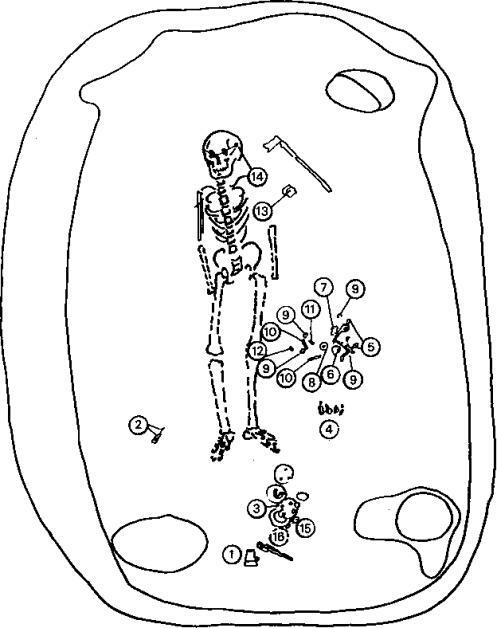 On the reed-covered bottom of the grave-pit were the remains of a human skeleton, lying on its back with the head oriented to the west (The wooden planking of the funeral tent may have been removed prior to filling). To the right of the skull was found a pendant or, more probably, an earring (Figures 2.14, 3.12). The ring-part is made of three twisted gold wires soldered together. This is joined to a cone bent from gold plate, in which a drop-shaped piece of turquoise has been set. 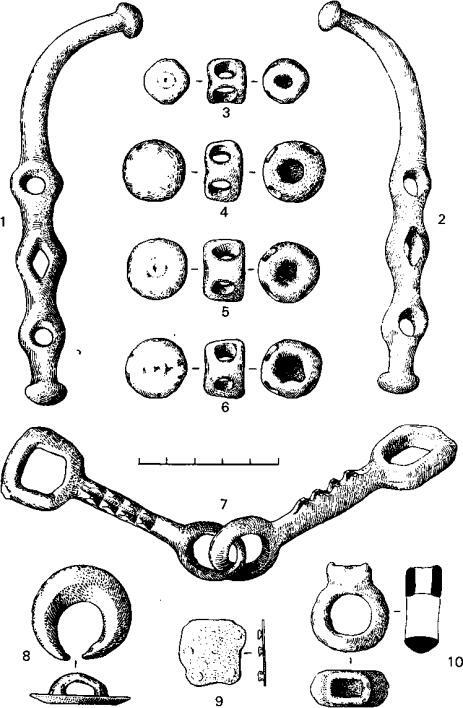 Fragments of similar pendants have been unearthed in a contemporary settlement situated 2 km from the burial (Vainberg 1979). On the right of the body an iron knife was found which had been deliberately broken (Figures 2.10, 3.11). Later the custom of breaking grave goods became widespread in the steppes, during the Sarmatian period. Ten bronze arrowheads were found lying close together - seven of the socketed type and three tongued (Figures 2.4, 3.1-10). The combination of socketed and tongued arrowheads is not characteristic for the European Scythians, who almost exclusively used socketed arrowheads. However, it is a combination which is typical of the Saka quivers. According to the Soviet archaeological chronology, such arrowheads are usually dated to the 7th century ВС, although some forms are known from sites of the late 8th century ВС. Next to the arrowheads was discovered a turquoise quiver toggle (Figures 2.12, 3.14). A spectral analysis of the clasp has shown that the turquoise originated from a deposit found in the Kizilkum (Kyzylkum) desert, east of the Amudarya riverbed (The Kyzylkum, Tr. Red Sand, desert in the 8th century ВС was not a desert, but a steppe. That territory is known from Avesta as Kangha, Persian for Kangar. The tongued design of the arrowheads, initially developed in the east of the Scythian areal, is for a war arrow intended to splinter on impact to prevent extraction, for greater injury and to make not reusable. The socketed hunting arrowheads are desired to be reusable). Lying at the feet of the body was a shaft-hole battle-axe or 'klevetz' (Figures 2.16, 3.13). The axe is bimetallic: its striking head is made of iron while the core and shaft-hole part are cast bronze. Like the knife, the axe had been broken before it was placed into the grave. During the pre-Scythian and Scythian periods the bimetallic klevetz axes of similar type were widespread in the steppe and forest-steppe zones (Chlenova 1981). Horse-harness is represented in the grave by various cast-bronze artifacts: a single-jointed bit (Figures 2.6, 4.7); a pair of cheek-pieces (Figures 2.5, 4.1 & 2); strap crossings (Figures 2.9, 4.3-6); a rein-ring from a halter or 'chembur' (Figures 2.8, 4.10), a belt plate (Figures 2.11, 5.1-8), a crescent-shaped bridle frontlet appliqué (Figures 2.7, 4.8). Typologically, such horse harness dates to the same period as the arrow-heads: bits with stirrup-shaped terminal loops seem to have appeared in the Asian steppes in the 8th century ВС and continued in existence during the 7th-6th centuries (K. Akishev & A. Akishev 1978). Our bit, with its semi-square finial and mouth piece roughened with double rows of small bosses undoubtedly belongs to the early stage. The same can be said of the cheek-pieces. They have three holes and mushroom-shaped terminals (in imitation of bone ones), the middle hole is rhombic. Cheek-pieces of similar type are known from the Late Bronze Age settlement of Dalverzin in southern Central Asia (Zadneprovsky 1962), in burials in the Caucasus (Aslanov et al. 1959; lesson 1965), and in the Sialk В necropolis, in Iran (Ghirshman 1939); they cannot be dated later than the 7th century ВС. Two buckles that originally decorated the saddle are in the form of a curling, feline, predatory beast, sometimes termed a 'panther' (Figures 5.1-2). This theme is familiar from stylistically similar finds from archaeologically Scythian sites in the Eurasian steppe. The closest - almost identical - analogies come from the Early Saka burial of Uigarak on the lower reaches of the Syrdarya (Vishnevskaya 1973). Five more appliqués - two larger and three smaller ones (Figure 5.4-6) are made in the form of the head of a fantastic beast - a griffin. This image combines the traits of a beast and a bird of prey. Shown in the bird's beak are large and sharp teeth of a beast of prey. The syncretic character of the griffin can be explained in terms of the master craftsman's intention to create an image of a special power, to try and unite in a single image the stronger qualities of different animals - in the present case the strength of a bear, speed of a bird and the crushing force of the teeth of a tiger or a snow leopard. We must thus view the monsters from Sakar-Chaga in connection with the bird Sayen known from Zoroastrian texts. In the mythological tradition of the Zoroastrians this bird has the teeth of a beast of prey and other similar traits. 'Sayen-bird is not of a single nature but of three substances and is not created for this world' (Bongard-Levin & Grantovsky 1983). In the 6th and especially in the 5th century ВС, griffin depictions became the most popular theme in the art of the European Scythians. However, archaeological finds from the Scythian and pre-Scythian period provide no exact analogy for the monsters from Sakar-Chaga. These depictions are thus absolutely unique and of great interest. There is every reason to assert that our finds are the earliest depictions of griffins in Scytho-Siberian 'animal style' art. Judging by the composition of the funerary inventory, we are dealing here with the burial of a warrior, and the typological analysis leads to the conclusion that the interment took place, most probably, in the first half of the 7th century ВС, i.e. at the time when the Scythians had not yet returned from raiding Asia Minor (cf. Herodotus 1.106) (It is very unlikely that Masguts as a political union were invited to fight in the Asia Minor, they were a breed separate from the European Scythians, politically as well as linguistically. Scythians did not call for Masguts participation in the defense against Darius raid, they did not belong to the European Scythian confederation. No written record names Masguts as participants in the Asia Minor campaign). What suppositions can be made about the ethnic origin of the buried person? According to Herodotus (1.204), a considerable part of the plain east of the Caspian Sea was inhabited by the Massagetan tribes who were worshippers of the horse and the sun. 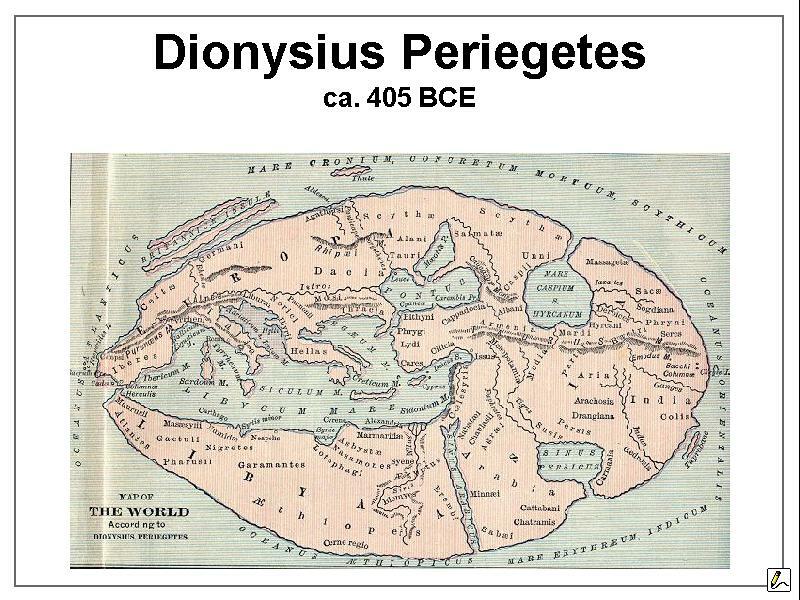 Commentators on Herodotus and students of his texts usually place the Massagetae in the Trans-Caspian and Aral Sea territories (for a review of the relevant historiography see Dovatur et al. 1982), i.e. they place them in the same region where was excavated the burial described here. Strabon (XI.vi.2) also placed the Massagetae and Saka in that area. 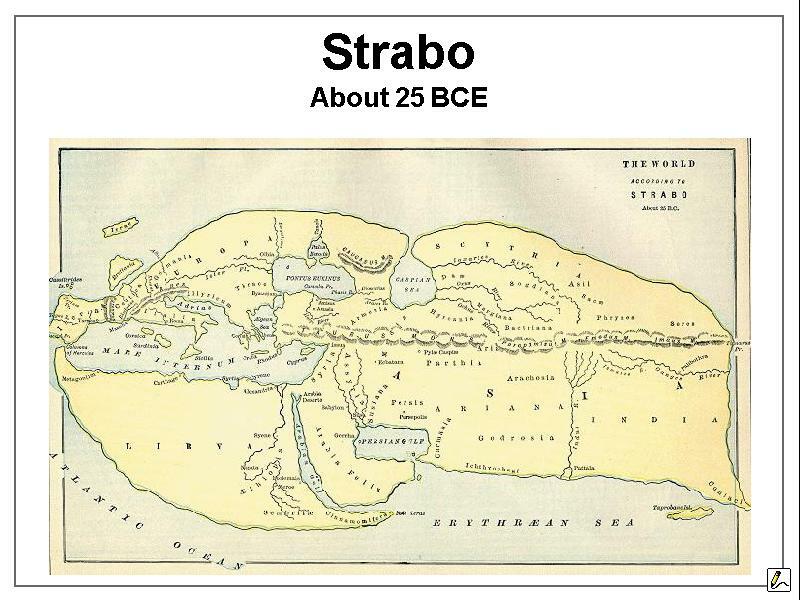 Strabo (XI.vii.6) indicated further that the country of the Massagetae was watered by the Araxes river which 'splits into numerous branches and empties by its other mouths into another sea on the north though by one single mouth it reaches the Hyrcanian Gulf (In Strabon's time, the Hyrcanian Gulf was called "Nomadic" Gulf, from the Tr. Iyirk "nomad". This is important distinction, since the Delta Masguts were semi-sedentary, and not nomads that follow established seasonal pasturing routes. Ethnically and culturally they may not have differed, but ethnologically that was a sea of difference, like today's a city dweller and a peasant). The geographical situation described by Strabo is closely reminiscent of the one that had developed in the South Aral Sea territories. The Uzboi river can be seen as the only channel of the Amudarya which issues into the Hyrcanian gulf (i.e. into the Caspian Sea), and the northern delta of the Amudarya with its "numerous branches", respectively. It is not accidental therefore that the Araxes of Herodotus and Strabo ("aryk" in Tr. is a channel) is identified by a majority of researchers with the Amudarya (although other opinions have been expressed: for a review of the data see Pyankov 1975). The textual evidence is not, at any rate, in contradiction with the supposition that the burial under discussion here belonged to not other but the Massagetae. Indeed, the complex yielded a very striking and expressive set of artifacts typical of Saka kurgans, in which manifestations of the cult of the horse and the sun are vividly present. 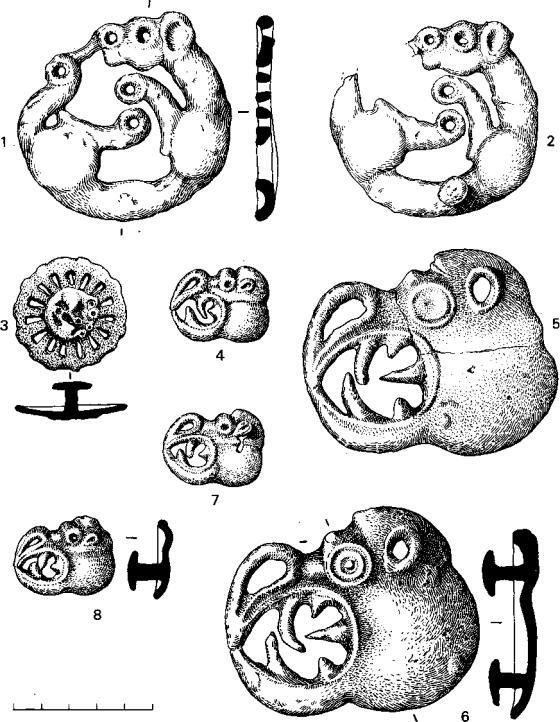 In this connection we should consider one more find from the burial: a bronze appliqué with a relief depiction of a curling 'panther' set at the center of radiating sun rays (Figure 5.3), a find which no doubt reflects the solar ideas of the ancient pastoralists of the Aral Sea region. It is interesting that the stylized silhouette of the panther at the center of the solar sign is the same as the animal representations which form the larger appliqués found in the grave. It is not out of place to recall that in ancient Assyria the image of feline beasts of prey was the symbol of the sun (A. Akishev 1978). In the east it is marked by such archaeological sites as South Tagisken and Uigarak. These burials are situated within the ancient delta of the Syr-Darya and have a funeral rite and some items of grave inventory that are extremely similar to the Amudarya complexes. In the west the world of the Massagetae must be delimited for the time being by the boundaries of the Sary Kamysh delta - no complexes dated earlier than the 5th century ВС have as yet been discovered on the Uzboi river or the Uzboy plateau. To the south the area occupied by the Massagetan people was limited by the sands of the Karakum and Kizilkum deserts, and to the north and northwest its natural border was demarcated by the Usturt plateau which was practically waterless - only suitable for seasonal grazing, not for permanent occupation. Akishev, A.K. 1984 . The art and mythology of the Saka. Alma Ata: Nauka. = Акишев A K. 1984 Исскуство и мифология саков. Алма-Ата: Наука. Bongard-Levin, G.M. & Е.А. Grantovsky. 1983. From Scythia to India. Moscow Mysl. = Бонград-Левин Г.М., Грантовский Э.А. 1983. От Скифии до Индии. Москва: Мысль. Dandamayev , M.A. 1963. The campaign of Darius I against the Scythian tribe of the Tigrakhauda, Brief communications of the Institute of the peoples of Asia 61. Moscow: Nauka. = Дандамаев, M.A. 1963. Поход Дария против скифского племени тиграхауда. - Краткие сообщения Института народов Азии, 61. Москва: Наука. Griaznov, M.P. 1980. Arzhan: a royal barrow of the Early Scythian period, Leningrad: Nauka. = Грязнов, М.П. 1980. Аржан. Царский курган раннескифского времени. Ленинград: Наука. Iessen, А.А. 1965. 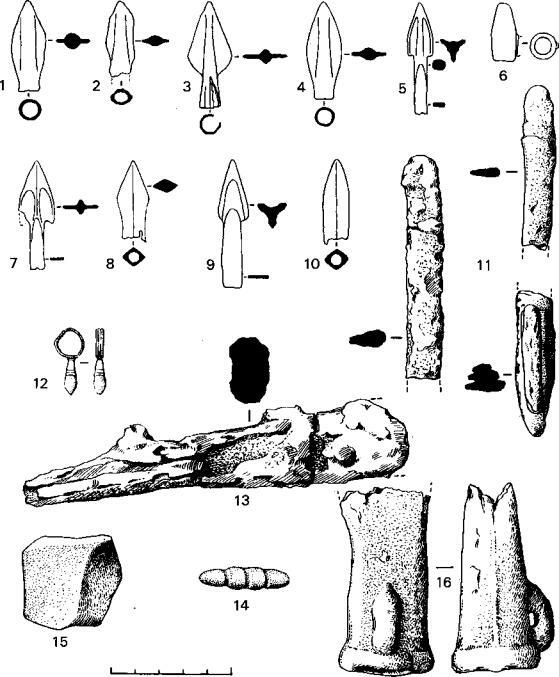 From the historical past of the Mill Steppe, in Transactions of the Azerbaijan archaeological expedition(Materialy i issledovaniya po arkheologii SSSR 125 (2). = Иессен A.A. 1965. Из истории прошлого Милльской степи. - В кн. : Труды Азербайджанской археологической экспедиции. (МЯЛ 25; вып.2). Litvinsky, В. А. 1972. The ancient nomads of The roof of the world'. Moscow: Nauka. = letter-spacing:Литвинский Б.А. 1972. Древние кочевники "Крыши мира". Москва: Наука. Pyankov, I.V. 1968. The Saka as a concept, Proceedings of the Academy of Sciences of the Tadjik SSR, Department of Social Sciences 3. Dushanbe: Nauka. = Пьянков И В.1968. Саки (содержание понятия).- Известия АН Тадж.ССР;3. Душанбе: Наука. Tolstov, S.P.& M.A. Itina. 1966. The Saka of the lower reaches of the Syrdarya in the light of the material from Tagisken, 1, Sovetskaya Arheologiya 1966(2). = Толстов С.П., Итина M.A. 1966.Саки низовьев Сырдарьи (по материалам Тагискена). - СА;2. Vainberg, B.I. 1975. The Kuyusay culture of the Early Iron Age in the Prisarykamych delta of the Amudarya, in Achievements of Central Asian archaeology 3. Leningrad Nauka. = Вайнберг Б.И. 1975 Куюсайская культура раннего железного века в Присарыкамышской дельте Амударьи.-В кн. : Успехи среднеазиатской археологии; вып.З; Ленинград: Наука. 1979. Vainberg, B.I. 1979. Sites of the Kuyusay culture, in Nomads on the borders of Khorezm (Transactions of the Khorezmian archaeological-ethnographical expedition 11). Moscow: Nauka. = Вайнберг Б.И. 1979. Памятники куюсайской культуры. -В кн. : Кочевники на границах Чорезма. (Труды Хорезмской археолого-этнографической экспедиции-, 11) Москва: Наука. Yablonsky 1986'L.T. 1986. On the ethnogenesis of the population of North Turkmenia: the early Saka burial of Sakar-Chaga 3, Sovetskaya Etnografiya 1986 (5). = Яблонский Л.Т. 1986. К этногенезу населения Северной Туркмении (могильник раннесакского времени Сакар-Чага 3). - Советская этнография; 5. Москва, Наука. 1988. In the historical times, the Persians refer to the Saka Tigrakhauda (“pointed hat” Scythians) and in the Greek rendition Kermikhions, and the classical Greek authors refer to the Scythian Melanchlaeni (literary, Gr. Black Mantle) as pointed hat peoples. Later, in the 9 c AD, pointed hat Türks “Black Klobuks” (Black Hoods) fought against and as mercenaries for the ruling elite of the incipient Rus Principalities. Pointed hat Kara Kalpak (Tr. 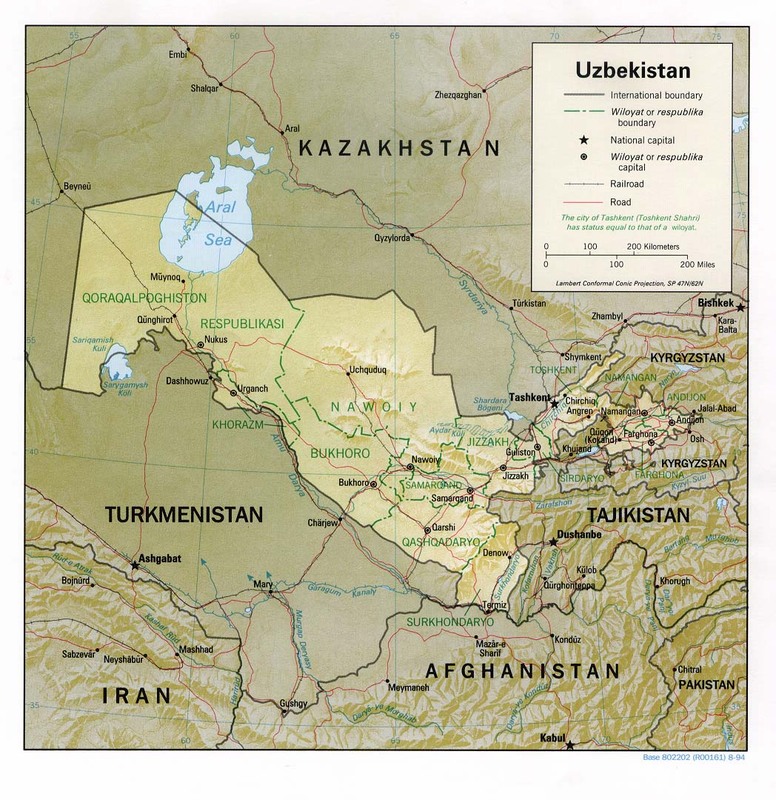 Black Hat) Türks continue to inhabit the same area south of the Aral Sea, in the present day Kara Kalpak Autonomous Republic. The pointed hat remains a national headdress of Bashkirs (Bashkorts), descendants of Masguts, possibly a northern nomadic branch of the Greek’s Massagets. The Türkic “Kazaks”, integrated into the Middle Age East European principalities, continued to remain a distinct military class until the 21-st century. The warriors of the 3-5 cc AD Hun army, of the Bulgarian and Avar Khaganates of the 6-8 cc, of the Slavic, Rus and Türkic principalities of the 9-12 cc, then of the Rus and Slavic confederations and the Türkic Kipchak Khanate of the 13-15 cc, then of the centralized Rus and Türkic principalities of the 16-17 cc, then of the Imperial Russia and Türkic states of the 18-20 cc, and finally “united” under a single fist of the former USSR, the Pointed Hat people left a legacy visible today in all remnants of the empire. The pointed sheepskin hat, called “papakha”, continues to be a trademark of the upper military class in that area, and is proudly displayed at the military shows. The “papakha” is known from the reliefs on the vessels attributed to Greek artisans, as well as from the Assirian and Persian reliefs. The Greeks depict the Persian warriors only as Saka/Scythians, giving a visual impression that the Persian army did not have any conscripts, but consisted only of Türkic mercenaries with characteristic leather boots, pants, belt buckles, composite bows and ….pointed “papakha” hat. “Masgut” and its derivations remain “popular” last names among the people living in the “Scythian” territories and the territories historically adjacent to the Northern Pontic, Caspian and Aral Seas. Quite a number of the East European outstanding people carried this last name. The legacy of Herodotus and Massagets (Tissagets, Thyssagetae), cemented into the birth certificates, passports and titles of the publications, continues.